It's never too late to make a second impression. Roughly 98% of consumers will leave a site without converting. Here is your chance to re-engage them with a completely new level of performance and insight. Site Retargeting targets users who have already visited your site while they are visiting other sites across the web. Site retargeting is a highly effective method of converting site visitors into purchasers. 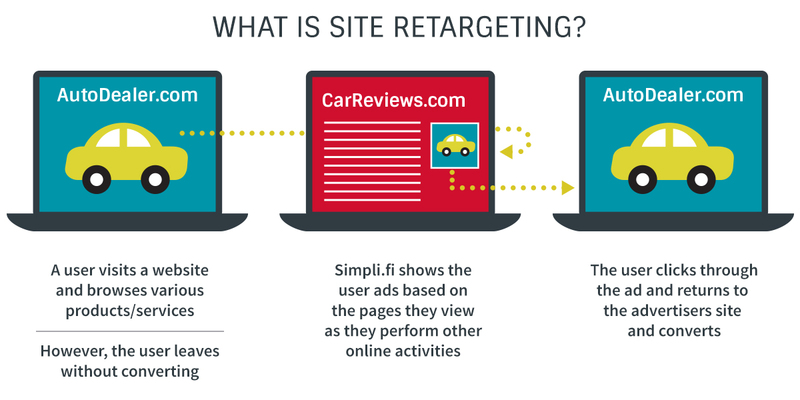 Simpli.fi brings the advantages of element level marketing to site retargeting. While most retargeting companies still operate at the group segment level, Simpli.fi enables bidding, reporting, and optimizing down to the smallest data elements, such as products, categories, or pages viewed. Improved ROI: By bidding, reporting, and optimizing campaigns at the element level, Simpli.fi site retargeting campaigns outperform segment based campaigns. Massive Scale: Simpli.fi campaigns access inventory from all major exchanges. This enables you to maximize delivery of your site retargeting campaigns while delivering ads at just the right time and place. Audience Expansion: Understand the search and site visitation patterns of your existing customers and target new prospects who browse and search online just like your client base.